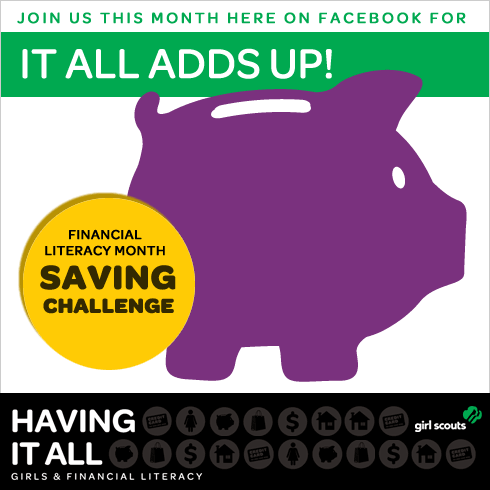 On Monday, April 15, 2013, the Girl Scout Research Institute will release our new program, Having It All: Girls and Financial Literacy. It's time to get ready! 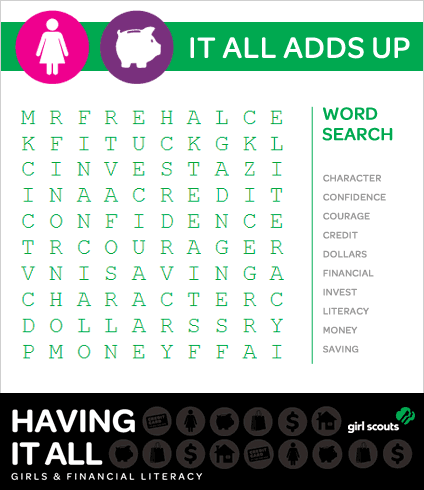 Let's take Girl Scouting to the next level of financial know-how! We are already gearing up toward the release of the new program, which will help you teach your girls financial literacy and empower them to reach their future goals. SAVING is the name of the game! We're teaming up with parents to help girls understand the importance of earning money and saving for things they want. Make sure you have your girl set a goal. What does she want to do with the money she’s saved? Next, help her choose a piggy bank. It may be a coffee can, a pink piggy, or even a savings account at your local bank. You can even make it a friendly competition between siblings. So parents: are you with us? Let’s get started! GSUSA will be providing fun activities for the girls all month long and they will be on our Facebook page. Here's a word search to help your girl get started, and to teach her that earning and saving can be fun! With this new program, Girl Scouts can develop real skills and earn national recognition in the area of financial literacy. Here's to helping your girl reach her dreams!